When arts organizations in Elgin and Crystal Lake faced a do-or-die crisis, it took some creative business strategies and a public plea to turn things around. This is the story of how Elgin Symphony and Raue Center charged back from the brink with a renewed focus on the future. As unusually heavy rains pounded down, rainwater dripped backstage. From the streets outside it seeped into the basement, too. Performers suspended the show for 20 minutes, until the storm had passed. Those heavy rains couldn’t have come at a worse time. Cash was running short – as it occasionally does when you’re running a nonprofit arts organization. On its own, this was manageable. But this was late summer, and the busy fall season was yet to begin. Ticket revenue was coming, but could it cover the immediate needs? Major bills were coming due. That’s when the board of Raue Center for the Arts, in Crystal Lake, decided to make their plight public. If they could engage the right donors and arrange favorable terms with debtors, they figured they could solve their immediate needs and secure a stronger footing for the future. Over a couple of harrowing months in late 2017 and early 2018, the team at Raue Center made its case, and in March, they declared they had a deal. The ink was barely dry on Raue Center’s deal when Elgin Symphony Orchestra (ESO) was asking if it, too, could survive the season. “We ran into a situation where we anticipated getting some donations that didn’t happen, and we were in a position where we had no other financial options we could take,” explains symphony CEO Dave Bearden. Donors quickly stepped up to bridge the gap. But Bearden wasn’t ready to stop there. In the months since, he and the ESO team have been re-evaluating their business model and their approaches to fundraising. Raue Center, too, is re-examining its strategies with an eye on long-term sustainability. Whether you’re a small business or a nonprofit, cash flow and revenue are a persistent question. Yet, the unique dynamics of a nonprofit organization – especially in the arts – leave it uniquely vulnerable. Creative revenue streams and cost-consciousness are par for the course, but there’s also a somewhat paradoxical value proposition. In Crystal Lake and Elgin, donors stepped up in many ways to protect their communities’ cultural assets. This is the story of how creative business practices, determined leadership and a loyal donor base rescued Raue Center and ESO from the brink. It’s easy to take for granted the many costs involved in running an arts organization. Not only do you have to pay performers, but you also have to support a large front-of-house and back-of-house team – people who run the box office, people who usher patrons, people who run sound boards, lightboards and backstage needs. And then there’s the marketing, the educational programming and myriad other forms of outreach, including festivals. For Raue Center, certain legacy costs further complicate the situation. Before it was established in 2001, the former movie house was expected to become a civic center. The City of Crystal Lake, in fact, still owns the building. But due to legal complications, the City found it easier to hand off management to a nonprofit organization. The Raue association was granted a long-term lease and handed the remodeling bill. Throughout the years, Raue Center management has found numerous ways to expand its revenue streams. It established the Williams Street Repertory theater company in 2011. The venue also hosts periodic comedy shows and tribute bands, as well as youth-focused programming and performing arts workshops for youngsters. Educational programming has grown 400 to 500 percent over the past two years, says Kuranda. Raue Center also hosts festivals like the fall Rauetoberfest and a Halloween event, among others. For all of its draw, just 38 percent of Raue Center’s income originates in the box office. The remainder comes from private and corporate donations, in addition to an annual $180,000 grant. The venue counts among its supporters numerous local firms, including Stryker (formerly Sage Products), Crystal Lake Bank & Trust and BMO Harris Bank, which together contribute as much as $770,000 a year to the Raue Center’s annual $2.2 million budget. In return for those generous contributions, Kuranda and his team seek to keep administrative costs low. He says the Better Business Bureau once noted that 93 cents of every dollar received went directly to programming. “It means more direct support for the artists,” he says. ESO performances are just one of many ways this regional symphony touches the communities it serves. You’ll find ESO musicians playing in the lobby and wards of Advocate Sherman Hospital and Good Shepherd Hospital. Every spring, nearly 9,000 area elementary and middle school students visit the Hemmens to watch the orchestra live in action. ESO guest artists host special master class workshops for student musicians, and this season, Grams leads a new master class for adults. A few days before Classics Series performances, ESO hosts “Listeners Club” events where the music is introduced and explained. But funding such a range of programming is a constant question. Like Raue Center, only about a third of ESO’s income originates from ticket sales. The remainder comes from private donors, corporate sponsors, foundations and government grants. ESO tickets come in three tiers, ranging from $30 to $75. Keeping the symphony affordable and accessible is an important part of building audiences and continuing the mission, says Bearden. The City of Elgin donates office space, and the Hemmens provides a discount, but in general, “the era of funding by government is over,” says Bearden. Corporate and individual sponsorships have to come from sources that value the arts. “In general, funds we get come from companies recognize the importance of culture in a community and what it does to the fabric of life for their employees,” he adds. 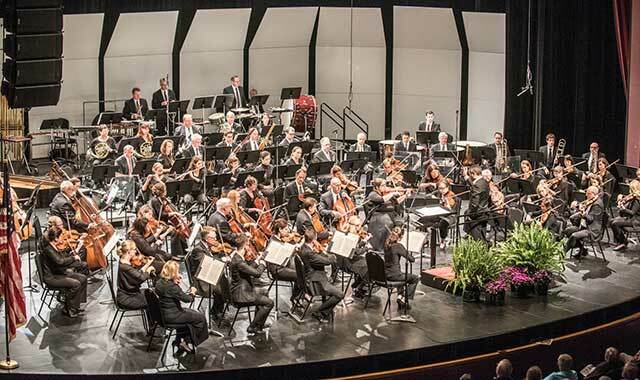 Bearden estimates about 60 percent of ESO’s $2.3 million budget covers orchestra-related expenses, including musicians’ pay, music rentals, guest artists and facility rentals. About 20 percent covers office personnel while another 20 percent covers administrative costs such as marketing, development and related “business” expenses. Financial management is a constant challenge. In the six years Bearden has led ESO, cash shortages have come and gone. But nothing quite compared to what happened this past spring. 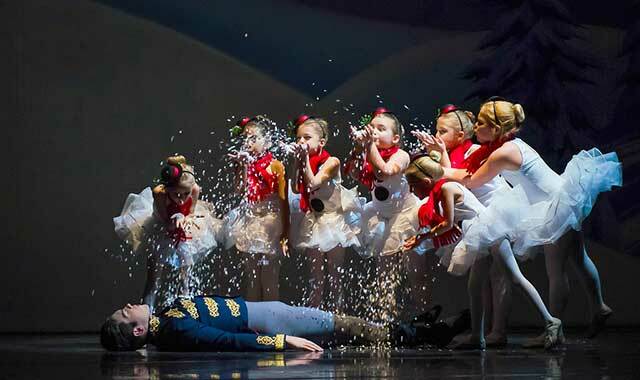 Raue Center programming includes adult and youth performances, like the annual production of “The Nutcracker,” with youths from Berkshire Ballet Theatre. As those late-summer rains pounded Raue Center, they made a conspicuous impact on the new fiscal year, which had just started July 1. Taking their plight to the community seemed the most prudent thing to do. For help, the board turned to local marketing expert Susan Dobbe-Leahy, owner of Dobbe Marketing, in Crystal Lake. “Dobbe Marketing provided public relations strategy focused on fostering and maintaining positive, collaborative relationships throughout the process of retiring their debt,” says Dobbe-Leahy. She helped Raue Center to sum up its situation – immediate cash needs, long-term debt – while promoting its economic benefits to the community – an impact of about $250,000 in annual tax revenue and nearly $32 million contributed to the local economy, according to a Raue Center press release sent Nov. 28. At the same time, Raue Center also sought the big ask. In December it petitioned the City of Crystal Lake to provide an annual operations grant of $109,000 in addition to a $140,000 annual building grant that would fund major facility expenses over the next 10 years. But before the request came to City Council, an anonymous donor intervened. For the next few months, conversations continued between Raue Center and several contributors. On March 13, leaders announced they’d reached a deal. “We ultimately came up with a deal whereby Home State Bank signed onto a 25-year agreement with us that they’ll take care of the capital related to new building expenses, and some private donors stepped up and took care of the $2.3 million debt,” says Kuranda. Through the process, Raue Center racked up additional support from the community at large. Pinpoint ESO patrons on a map, and you’ll find little more than a quarter come straight from Elgin. The rest come from as far as Wheeling, Barrington, Crystal Lake, Aurora and Wheaton. In the same way it draws from a wide geography, ESO also casts a wide net for donors. Bearden believes there’s an inherent strength in broadening the base of donors and patrons. Bearden saw that pyramid expand even broader this spring, as ESO made its public appeal for financial support. Over the course of four days in late March and early April, donors of all stripes pitched in, giving directly to ESO through its office or the crowdfunding website crowdrise.com, where donations can still be made. Since April, Bearden and his team have adjusted their business model to better account for fluctuations in spending. An outside consulting group, with specialties in nonprofit fundraising, has homed in on key strategies, including the pursuit of longer-term commitments. Through more frequent discussions, Bearden and his team have netted major five-year commitments from two area corporations – one a first-time donor and another a longtime sponsor upping its commitment. The team is also working to create a reserve fund that can handle interruptions in cash, as happened this past spring. Bearden believes part of ESO’s successful comeback lies in the deep support it enjoys around the Elgin area and in the broader Fox Valley. It falls right in line with ESO’s encouragement to “come as you are” to symphony performances. As the orchestra seeks new patrons and engages with younger generations, it’s doing more to cast away the pretentions of the past. More effort is being placed on being intentionally welcoming and open. And when you do visit the symphony, don’t come alone, says Bearden. Bring a friend. The past 12 months have brought a lot of introspection for the team at Raue Center, which Kuranda says is already accustomed to persistently reinventing itself. In particular, Kuranda notices the board is less interested now in taking on risk. It’s meant hiring fewer big-budget performers, but it’s also meant more careful attention to new programming – the bread and butter of an arts venue. When Raue Center’s outdoor block party, Williams Street Fest, was nearly rained out two years in a row, board members asked whether it was worth risking a third year. Instead, Kuranda and his team are now cultivating more donors, building their base from about 137 donors in fiscal 2017 to nearly 700 a year later. And given its concerns from a year ago, the board is also re-evaluating its physical plant needs. Kuranda is optimistic about the addition of board member John Green, a real estate developer who’s now creating a long-term strategic plan with Raue Center’s facilities committee. When donors support groups like Raue Center and ESO, they’re proclaiming that they value cultural organizations and their impact on society. And when it comes to business, Bearden, a former executive at Panasonic, finds such cultural organizations are often the differentiator when it comes to business attraction and retention. Not to mention, they’re also economic drivers for many downtowns. Elgin restaurants feel the increased traffic on concert weekends, Bearden says. So do the shops and restaurants in downtown Crystal Lake, which has grown from a largely vacant neighborhood in 2001 to a vibrant economic district. “According to the Illinois Arts Alliance, we generate, I think, something between $3.5 to $3.7 million in economic impact and tax revenue to the City of Crystal Lake,” says Kuranda. Much as arts organizations need money, they also require a strong volunteer force, willing to pitch in on everything from event setup to classroom instruction. Raue Center maintains 400 volunteers while ESO maintains more than 100. Of course, success is measured by many factors. In a nonprofit arts organization, every day is a fight for relevancy. But for the teams at Elgin Symphony Orchestra and Raue Center for the Arts, forever is just what they have in mind. This entry was posted on Wednesday, November 21st, 2018 at 12:00 pm	and is filed under Northwest Business Magazine, Top Posts. You can follow any responses to this entry through the RSS 2.0 feed. Both comments and pings are currently closed.